When you’re pregnant, it seems that many things change, including your diet. 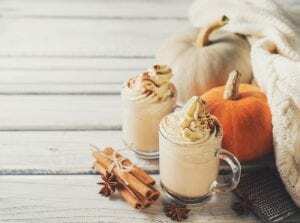 Since pumpkin spice is often incorporated into many fancy coffee drinks these days—think your favorite cup of pumpkin spice latte upon the start of the fall season—you may wonder if you can still have pumpkin spice separate from the caffeine. Pumpkin is a popular fall fruit and a member of the squash family. It is tasty and can be used in a variety of foods and beverages, like pie, bread and even smoothies. If you enjoy the occasional treat that includes pumpkin as a key ingredient, you may wonder if it’s safe to have when you are expecting. After all, when you are pregnant, you have to make certain changes to your everyday lifestyle. Some foods are perfectly safe, but others can be risky to your health and that of your unborn baby. Pumpkins are not only delicious, but they are also full of vitamins and antioxidants. They contain vitamins A, C and B-6, as well as zinc and iron. Their seeds also offer numerous health benefits for everyone, including women who are pregnant. Pumpkin seeds are rich with vitamins, minerals, protein, and omega-3 fatty acids, while being low in calories at the same time. Excellent source of nutrition: Pumpkins are loaded with essential nutrients, vitamins, minerals, proteins and carbohydrates. Controls blood sugar levels: Eating pumpkin can help to keep your blood sugar levels in control, which is important for pregnant women as gestational diabetes is a condition some develop. To get the maximum benefit, eat pumpkins without added sugar. Prevents diarrhea and eczema: Eating pumpkin can help to prevent common problems pregnant women deal with, notably diarrhea and eczema. High in protein and fiber: Pregnant women can greatly benefit from the high protein content from pumpkins. Pumpkins also have a high fiber content, which is good for combating constipation, which plagues many pregnant women. Eases cramps: Consuming pumpkin also helps to keep cramps at a minimum. Cramps are normal during pregnancy as women’s bodies change to accommodate the growing baby. Although there are many health benefits women can enjoy when they consume pumpkin while pregnant, there are also side effects of which they should be aware. It’s important to avoid eating too much pumpkin because it can lead to stomachaches, due to its high fiber content. Some women may also be allergic and should avoid it, as a pumpkin allergy can result in reactions that include coughing, wheezing, shortness of breath, stomach cramps, and vomiting. As a general rule, pregnant women should limit their consumption of pumpkin to only moderate amounts. This can help them to avoid potential side effects while they reap the numerous health benefits. Previous Post: « The Nesting Phase of Pregnancy: New-Mama OCD or Evolutionary Practice?